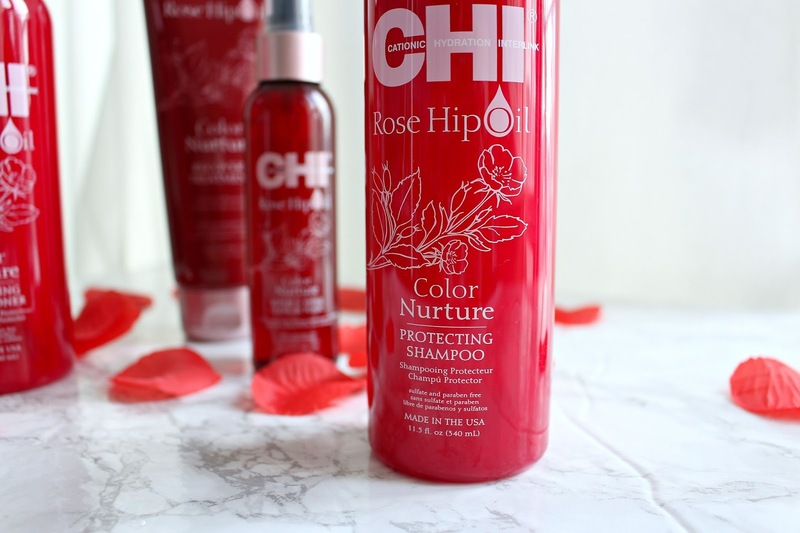 Farouk Systems Inc recently released the Rose Hip Oil Colour Nurture line from CHI. 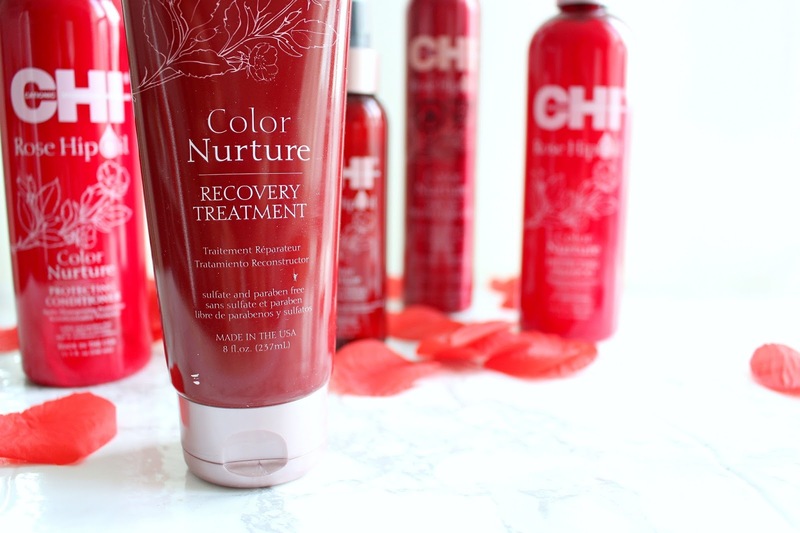 It's been formulated to nourish colour maintenance with rose hip oil, antioxidants and low PH levels. I have 5 of 6 items in the line, I skipped on the dry shampoo as I have dry, curly hair. My hair has no issues with volume or greasiness. Rose is all the rage lately, and I have been loving it! I don't know if it's because I'm getting older or rose scents are less ... old lady floral? That being said, none of these products have a true rose scent, so wether you like it or not it really doesn't come through prominently. It has a very fresh scent, quite light. Some of the beneficial ingredients included in this line are rose hip oil (obviously), silk, vitamin c/antioxidants and UV protector. Rose hip oil: This oil is easily absorbed and contains essential fatty acids and antioxidants to protect your hair colour. 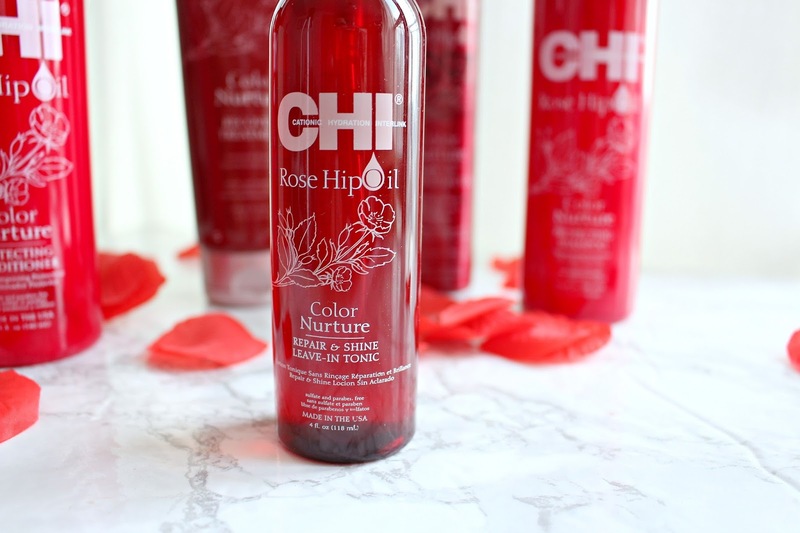 CHI Rose Hip Oil Protecting Shampoo $17.50 for 11.5 oz. This shampoo gives a nice lather and leaves my hair feeling clean. As someone with curly, dry hair I focus this towards the scalp and try not to over shampoo. It does not leave my hair feeling dry. It recommends lathering and rinsing three times but that seems incredibly, at least for my hair. 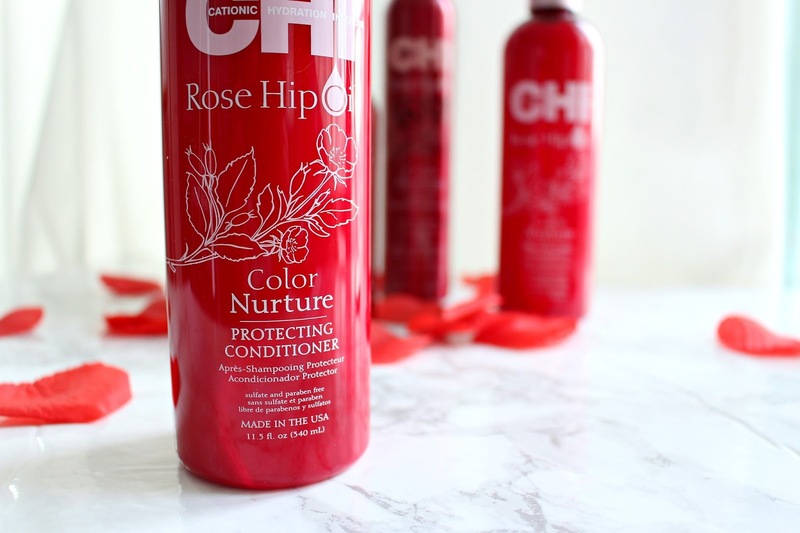 CHI Rose Hip Oil Protecting Conditioner $18.25 for 11.5 oz. I really like this conditioner! I think it could work for a variety of hair types, it isn't too thin but also isn't heavy to the point where it will weigh my hair down. It should be noted both the conditioner and shampoo come with a pump. I generally put in a ton of conditioner, and let it sit for as long as possible. Once it's sat on my hair, I brush out my hair and rinse with cool water. CHI Rose Hip Oil Recovery Treatment $21.75 for 8 oz. If you're looking for a thicker conditioner this recovery treatment is great. I generally mix this in with the conditioner to amp up the hydration. After taking a look in the ingredients, it doesn't seem to have protein. Protein is tricky, because it can be great for your hair but you can also overdo it and damage your hair. This is a nice option if you are looking to take a break from protein but want to treat your hair. 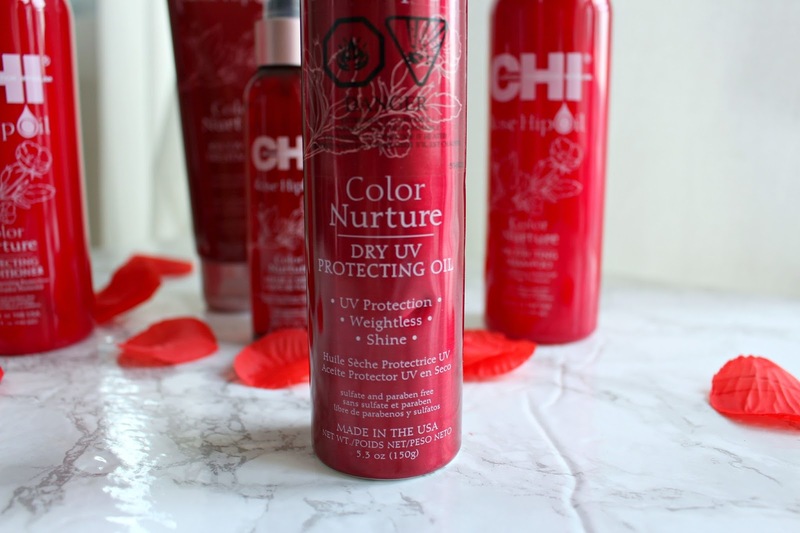 CHI Rose Hip Oil UV Protecting Oil $17.50 for 5.3 oz. This is one of the first dry oils I've tried. It is super lightweight and gives a nice light sheen to the hair. I like using this when wearing my hair up in a bun or ponytail. I can't speak to the UV protection factor, I'll have to take their word for it. But if you are looking for something to add a sheen without prematurely fading your hair colour this is a fab! CHI Rose Hip Oil Repair and Shine Leave-In Tonic $17.50 for 4 oz. I like adding this tonic to my hair straight out of the shower. It is vitamin infused to help further condition the hair without stripping it. It also helps to add shine and make it more manageable. Again, this is another super lightweight product, for me I like to balance with heavier and light to make sure my curls are bouncy and not crunchy. Overall, I think this is a great haircare line for someone with colour treated hair. 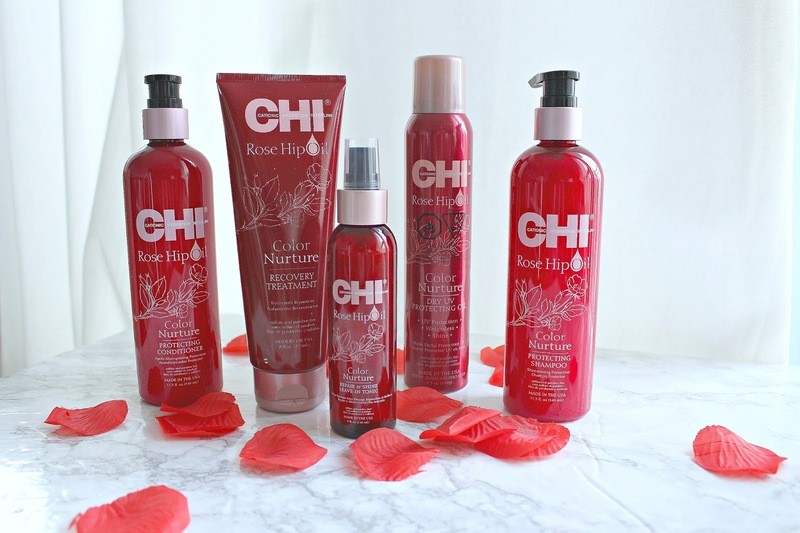 My hair is colour treated but also very curly and dry so it does need some supplemental items but I have really enjoyed incorporating the CHI Rose Hip Oil line into my routine! *These products were provided for my review and some links may be affiliate.